Be ultra-romantic and express the love of your life this coming Christmas day! Cherish the special day that you plan to exchange your vows with this Personalized Tree of Love Framed Print. This is a very unique way to express your feelings to the one that you love. Purchase a one of a kind framed photograph and make your special someone smile this Yuletide season. Carve your name with the name of your partner along with the special date and freeze the moment for a lifetime with this Personalized Tree of Love Framed Print. The frame features your own personalized information. That special information can be either your first meetings, the date when you captured each other’s heart, the date you and your partner became lovers, the date you became engaged or even the date you got married. 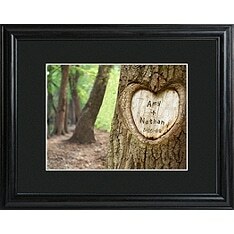 This Personalized Tree of Love Framed Print looks as realistic and as romantic as if you were the one who engraved it. The frame’s measurement is 23 inches x 19 inches including the black wooden frame. The mat with the image will appear in 13 3/4 inches x 11 3/4 inches in measure. It is a perfect personalized item to give this Christmas season that will definitely touch the heart of your significant other. Grab this Tree of Love Framed Print and let your memories be preserved forever. Oh I would absolutely love to have this gift for my parents. They have been married for 56 years and when they got engaged it was under a tree! They carved their initials in it with a heart just like the picture. This would be the most unique gift for them and something they would never think of buying themselves!